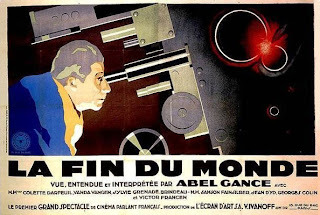 Abel Gance's - The End of the World. The predicted and much anticipated end of the world, expected just after 11am on Friday morning, may interfere with your last-minute Christmas shopping plans but it really can't be helped. However, I understand that Cllr Ian Driver is making a last minute attempt to bring the matter before the Council's Scrutiny Committee. This is despite the insistence of Labour's Council Leader, Clive Hart, that the imminent apocalypse is fully inclusive and that the residents of Ramsgate, lying directly in its path, have been properly consulted on potential environmental impact. As the instrument of universal doom, still remains uncertain, Cllr Iris Johnston has returned from Dublin to be with us and has written a strongly-worded letter to Charles Buchanan at Manston airport, insisting that no rogue asteroids should be permitted to land before 7AM and the same applies to Father Christmas, as some Ramsgate residents have complained in the past over low flying reindeer arriving at the cargo terminal after dark on Christmas Eve. I will of course attempt to keep blogging until the last possible moment and today, I'm promoting a special offer on flying marriage proposals for any reader that might wish to 'pop the question' before its too late. While here in Westgate, I'm recommending comfortable shoes and a supply of real ale, I understand that fellow, blogger, Michael Child, will be standing under the cliff at Ramsgate's Royal Sands, just after midnight, to see if it really does collapse and others who share his concerns are welcome to join him but please bring a vigil candle, wellington boots and warm clothing. As this is very much a public service announcement, please send in comments on your own plans or those in your town to deal with the end of the world. It's recommended that you divest yourself of all your worldly goods and I have a small amount of room available in my attic for precious metals, expensive works of art and large denomination bank notes, should you feel the need to surrender them. Our Council's 'Diversity Champion,' John Worrow will monitoring the situation to ensure that all minorities, faiths and interests are properly represented when the end finally comes, whatever shape it might take and that no one one group is seen to have an advantage over another on Judgement Day. His independent colleague, Cllr Dr Jack Cohen, has also negotiated free parking for all Birchington residents in the High Street from midnight. Clive Hart will shortly be issuing a press release, announcing his satisfaction that the end of the world will take place under an inclusive Labour Council; not a Conservative one and Margate's Mayor, Cllr Will Scobie, will be 'twittering' a live commentary from the top of the Arlington tower, just after 10:55 am tomorrow, should you wish to tune-in. Philip Hamberger, Thanet's new Director of Corporate Services & Transformation has reportedly left the Council before the end of the world arrives, leaving us all a little surprised and of course, the apocalypse will arrive after the Thanet Gazette goes to print, so nothing new there! Jason, our very wet 'Postie' just advised me that I've had my last letters now as he can't guarantee the sorting office will exist in the morning, so good luck and I recommend reviewing the first chapter of Douglas Adam's 'Hitchhiker's Guide to the Galaxy' before the evening. Lastly, the first picture, is a poster from an early cinema classic, the 1931 Abel Gance film, "The End of the World" which starred my grandmother, who was raised and lived in Westgate. Does this mean that we should adopt the brace position at midnight. Is this supposed to be humourous? Some may find it funny.. others not! Well I enjoyed it, 10:46, and I suggest you lighten up before it is too late. You don't want to be excluded because you have no sense of humour. Just had a chat with one of my readers' in town. Just to remind everyone... this weblog has a strong satirical theme and not every report should be taken seriously; i.e. it's very much 'tongue in cheek' at times so frequently you might have to read between the lines. Simon they say that many people facing the end often confess their sins in the hope of entering the pearly gates rather than facing an eternity of brimstone and treacle. With the end of the world close at hand, my question to you is this - which local politicians most need to confess their sins and why? I fear the list of past and present councillors may be too long and reading it could delay the end of the world! Thanks Simon, "reading between the lines" is far more entertaining than the actual text! Simon if your loft gets to full you can always send the surplus large denomination bank notes. It astonishes me that some people have no sense of humour ! Humourless folk are just the sort I will not miss if life on earth ends tomorrow ! It isn't going to happen, but if it does, we will know very little about it I suspect. Put the kettle on, keep calm and carry on, the next life has got to be better than this one ! I know I can face my maker with a clear conscience, how many at TDC can say the same ?! The funniest part was the advert attached to the "Deep Impact" clip when I watched it. The advertisement was for Offshore Formations £345, perhaps this is a recommendation for some of your friends Simon. Anyway it will be sad to see the end of your blog after only 116 years of publication, maybe you should revive your first post of 1896 to celebrate. Oh and by the way don't worry about Ramsgate, why change a habit of a lifetime. How typical of locals not to believe in an afterlife! Where's your faith? Great fun Simon, thanks for the laugh. When Jason (what do you think of his new look?) delivered the post this morning, I did tell him I'd forgotten to send a birthday card to my sister in law but I might as well save the cost of the stamp under the circumstances. :)See you in the brave new world on Saturday. I do hope you are right about this one Simon, if not there is going to be a problem tomorrow when people find out I have opened all my Christmas presents. Are you sure that you are not Eastcliff Richard? I detect some strong similarities in blogging style here. There's a thought.. maybe I was really Eastcliff Richard after all, an alter ego, Jekyll and Hyde. Sorry to inject a note of seriousness but just why did Philip Hamberger leave so suddenly and unexpectedly (for he has indeed gone, it's not part the Mayan joke), and what's it cost ?? Excellent Simon. This was witty and poignant satire which I much enjoyed. However, you appear to have upset one or two anonymice; and I do hope that this will not spoil your Christmas. It was mentioned in the above blog post about the end of the world, with any luck it will be the end of the TIGGERS and worrow along with Justin Bieber who will not be missed - A small price to pay if you ask me. If you are still here a very Merry Christmas to you. I shall sit here with my whiskey to drown my sorrows. It's the 30th of December now and I'm feeling rather perky for a dead person. Also, if this is the afterlife, it's not exactly what I had in mind! Best piece of statire I've read in ages.